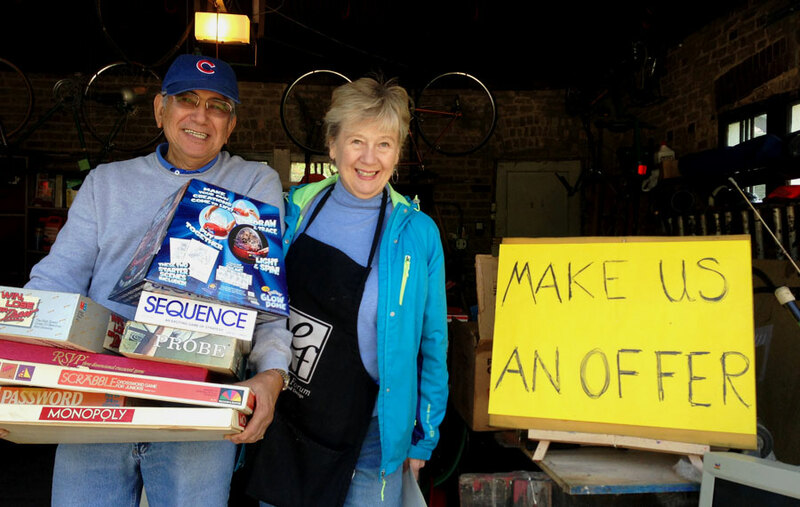 Every year Ravenswood Manor, a lovely and picturesque northwest side neighborhood, organizes its large, community-wide, garage sale. Spend your Sunday exploring the many bargains in the alleys and on the sidewalks of the neighborhood. 120+ households offer 1000s of bargains. Opens at 10:00am and closes at 4:00pm, rain or shine. Ravenswood Manor extends from Lawrence (4800N) on the north, to Montrose (4400N) on the south, from the north branch of the Chicago River on the east to Sacramento (3000W) on the west. It is west of Lincoln Square, east of Albany Park. See directions and map below. Map: Look for sales in the alleys and sidewalks throughout our neighborhood. The map below will be updated as sellers are registered. The annual Garage Sale is on the 3rd Sunday of May, the Sunday after Mother’s Day, rain or shine. Easy to get to on the CTA Brown Line stopping at the Francisco Station. Walk north or south from the station. CTA bus route 78 Montrose, east or west, get off at California, walk north into the neighborhood. CTA bus route 81 Lawrence, east or west, get off at Sacramento, walk east to Manor and south into the neighborhood.